The interannual variability of the South Pacific Convergence Zone (SPCZ) and its influence on tropical cyclone (TC) genesis in the South Pacific are investigated using observations and ERA40 reanalysis over the 1979–2002 period. In austral summer, the SPCZ displays four typical structures at interannual timescales. The first three are characterized by a diagonal orientation of the SPCZ and account for 85% of the summer seasons. One is close to climatology and the other two exhibit a 3° northward or southward departure from the SPCZ climatological position. In contrast, the fourth one, that only encompasses three austral summer seasons (the extreme 1982/1983 and 1997/1998 El Niño events and the moderate 1991/1992 El Niño event), displays very peculiar behaviour where the SPCZ largely departs from its climatological position and is zonally oriented. Variability of the western/central Pacific equatorial sea surface temperature (SST) is shown to modulate moisture transport south of the equator, thereby strongly constraining the location of the SPCZ. 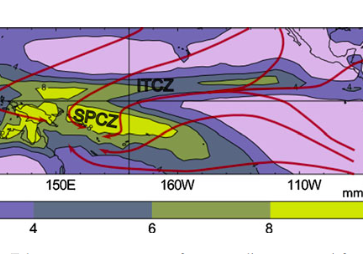 The SPCZ location is also shown to strongly modulate the atmospheric circulation variability in the South Pacific with specific patterns for each class. However, independently of its wide year-to-year excursions, the SPCZ is always collocated with the zero relative vorticity at low levels while the maximum vorticity axis lies 6° to the south of the SPCZ position. This coherent atmospheric organisation in the SPCZ region is shown to constrain tropical cyclogenesis to occur preferentially within 10° south of the SPCZ location as this region combines all the large-scale atmospheric conditions that favour the breeding of TCs. This analysis also reveals that cyclogenesis in the central Pacific (in the vicinity of French Polynesia) only occurs when the SPCZ displays a zonal orientation while this observation was previously attributed to El Niño years in general. Different characteristics of El Niño Southern Oscillation (ENSO)-related Pacific equatorial warming are shown to impact differently on the SPCZ position, suggesting that for regional scales, such as the South Pacific, the SPCZ classification is more appropriate than a simple ENSO index to characterize TC interannual variability. 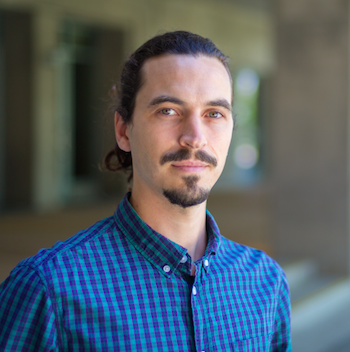 These findings suggest that forecasting the strength of El Niño through SST variations in the eastern Pacific may not be sufficient to accurately predict cyclogenesis in the South Pacific, especially east of the dateline.